The Registration social plug-in allows your audience to sign in to your website with their Facebook accounts and allows you to capture some data. Non-Facebook users can also use this plug-in to register for your website. To use the plug-in, all you need to do is add a single line of code to create a registration form on your website. 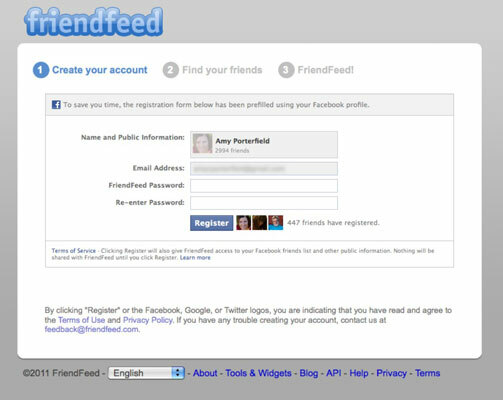 When users log in to Facebook and click the Registration button on your website, the form prepopulates with information from their Profiles. If users aren’t logged in to Facebook when they come to your website, the Register button automatically reads Login instead and prompts the user to log in to his Facebook account. After the user logs in to Facebook, he sees the prepopulated form to register for your site. Prepopulated means that a user’s name, e-mail address, birthday, gender, and current city can appear in the form automatically, depending on how you set up the Registration plug-in. This prepopulation feature in the Registration plug-in reduces drop-off during registration, because users (obviously) find filling out the remainder of the form much easier. This ease of use in turn increases the number of users who complete registration on your website. You may be wondering how this plug-in is different from the Login plug-in. Think of the Registration plug-in as being an advanced Login button. Both buttons allow you to collect data about your users upon login/registration, but the Registration button also allows your users to create a username and password to log in to your site. They can use that username and password each time they return to your site. In addition, the form that the plug-in creates allows you to add fields to ask for additional data not supplied by Facebook. When a user logs in for the first time, you can prompt her to answer questions you create. You may want to ask users questions related to your niche. If you own a wine shop, you might ask users to tell you their favorite wine. If you’re a Realtor, you might ask users to add the zip code of the location in which they’re looking to buy a home. To read more about the flow of the Registration button and to get ideas about to use it, go to http://developers.facebook.com/docs/user_registration/flows.